Using a geology-based assessment methodology, the U.S. Geological Survey estimated mean volumes of 896 million barrels of oil (MMBO) and about 53 trillion cubic feet (TCFG) of nonassociated natural gas in conventional, undiscovered accumulations within the National Petroleum Reserve in Alaska and adjacent State waters. The estimated volume of undiscovered oil is significantly lower than estimates released in 2002, owing primarily to recent exploration drilling that revealed an abrupt transition from oil to gas and reduced reservoir quality in the Alpine sandstone 15–20 miles west of the giant Alpine oil field. 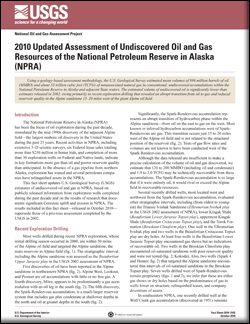 This fact sheet updates U.S. Geological Survey (USGS) estimates of undiscovered oil and gas in NPRA, based on publicly released information from exploration wells completed during the past decade and on the results of research that documents significant Cenozoic uplift and erosion in NPRA. The results included in this fact sheet—released in October 2010—supersede those of a previous assessment completed by the USGS in 2002.